For all previous posts on the Fidelity Select Rotational System, please visit the archive. There is quite a bit of history behind this system. Since some of you are likely new(er) here, I’ll start with a quick synopsis. My wife has a 401K with Fidelity. Of course every good trader wants to pilot all available capital, and I’m no different. But when its the wife’s money, one wants to make sure it is steered in the right direction. While investigating rotational systems, I discovered a site which presented a system using Fidelity Select Sector Funds (the site is referenced in the archive). This discovery presented a synergy of sorts – I could build and trade a rotational system in my wife’s Fidelity account. Something about birds and stones came to mind. Anyway, the primary purpose behind building this system has been to use it to trade my wife’s account. I want to be clear that the basic idea as well as some of the component parts of the system are not original to me. I will reference from where the ideas came as necessary. So with that out of the way, what were the goals for this system? Let’s look at each goal. There is ample research to support that a sector rotational system will beat the S&P and that these systems are robust. Perhaps the most accessible research is from Mebane Faber: Relative Strength Strategies for Investing. (This paper lists additional resources to support its foundations.) So that takes care of goals 1 and 3. As for protecting the account from catastrophic loss, Mr. Faber’s work can also be referenced – A Quantitative Approach to Tactical Asset Allocation details, among other beneficial aspects of a rotational system, the use of moving averages to protect an account from catastrophic drawdowns. Taking a similar approach ensures goal 2 is met. As for goal 4, the very nature of Fidelity Select Sector Funds limits the amount of time one can spend managing the system. Because the funds require a 30 calendar-day hold time, it will be financially punitive to make more than a few trades a month. Fidelity will increase the penalties each time a round-trip trade lasting fewer than 30 calendar-days is made, until the account is effectively locked out from trading in the funds. 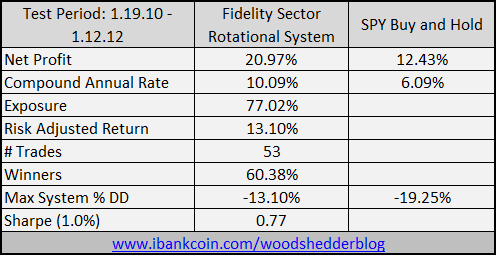 In the next post, we will examine the specifics of the existing Fidelity Select Rotational System (for which I’ve posted out-of-sample results over the last 2 years) and discuss where I seek to make improvements in order to finish the development. There will be some cool graphs and statistics and stuff, unlike this post. The finished system will begin live trading within a few weeks. It has been almost 2 years since I set out to build/test a rotational strategy to trade the Fidelity Select Sector Funds. Here is a link to all the posts about how the system was developed: Fidelity Select Rotational Strategy. Because the Fidelity Sector Funds (FSF) do not incur slippage or commissions, the results are as close to actual as they could be without taking the trades and having them audited by a 3rd party. The system has achieved 400 basis points of out-performance and reduced the buy and hold drawdown by one-third. I did not account for a return on cash (which would improve the system results slightly). I also did not account for any commissions/slippage for SPY (which would very slightly reduce the buy and hold results). These out-of-sample results are very encouraging. I am beginning to make some changes to the system which I believe will make it even more robust. Look for a post soon. Assuming I am satisfied with the changes, I plan to begin trading it live at the end of January or early February. Green means the system was either partially or entirely in cash. Drawdowns are shown in the lower pane. The system is currently long Construction and Housing; Biotechnology; and Defense and Aerospace. See all posts on this indicator here. At today’s close, the indicator closed its SPY short for a loss of -4.25% and opened a long position. The arrows show the trades. I’m still surprised at how small of a range the two measures (ROC5 and ROC252) are trading within. After further analysis, I’ve decided that the results of the last post, Dow Jones Golden Cross and the S&P 500 Has Not Crossed – Lackluster Year Ahead?, are not robust. I believe the results are a function of randomness (part and parcel of a small sample size) and the way I structured the test. I was still intrigued though, and so I changed the test a bit. 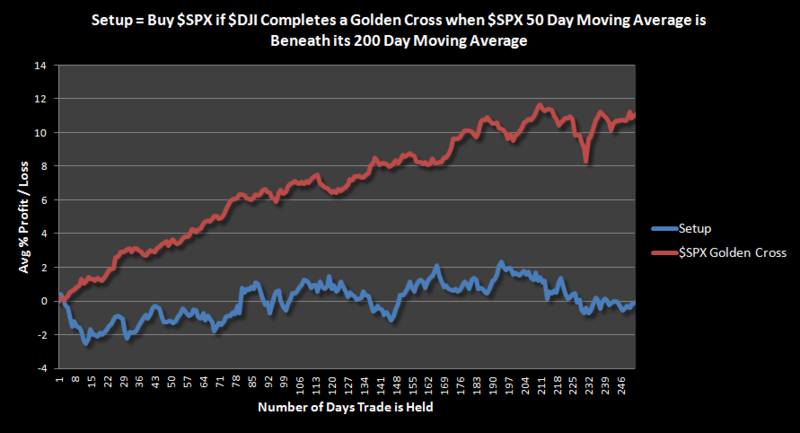 The new test trades the S&P 500 anytime that the Dow Jones completes a Golden Cross, as long as the S&P’s 50 day moving average is less than its 200 day moving average (just like the last test). Here is what I changed: Rather than holding the trade for X number of days, the S&P position is sold whenever the Dow Jones completes a Death Cross. Basically this setup is trading the S&P 500 rather than the Dow Jones, using the Dow’s GC signals, with the exception that we are buying the S&P when it has not yet completed a Golden Cross. Anyone confused yet? All the results below do not account for commissions or slippage. Data used goes back to 1960 for both indices. These results are significantly better than the results generated when NOT using the $DJI Death Cross as an exit signal. Thanks to the two or so readers who have followed me down this rabbit hole. I can tell by traffic that this series has not been very popular. I’ll promise to move on to more exciting things! Dow Jones Golden Cross and the S&P 500 Has Not Crossed – Lackluster Year Ahead? The previous post took a quick look at what happens one year later with the S&P 500 when the Dow Jones completes a Golden Cross before the S&P 500. This post will look back farther in hopes that we might draw some conclusions about what this might mean for the next year. I continue to look for what it might mean when the Dow Jones is outperforming the S&P 500. This test will use more than 60 years data from the S&P 500 and Dow Jones. The trade will be held for one year. No commissions or slippage included. 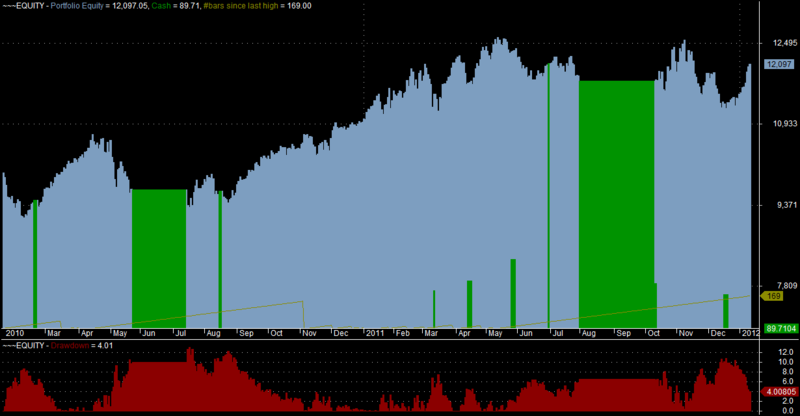 There were only 11 trades held the full 252 days for the setup (blue line) so sample size is very small. The first trade was on December 26th, 1962. We can see that this setup yields an average trade that is right at %0.0, after 252 days. This is not good. I suspect most randomly selected 252 day periods from $SPX would yield significantly better returns than the setup. For the sake of comparison, I included all the Golden Crosses on $SPX, with the first trade taking place in 1963 (red line). There were 22 trades held the full 252 days. After 252 days, the average return is near %11.5. Obviously, this is a huge improvement over the setup. I’m still not sure why the S&P 500 can barely muster a gain a year after a Golden Cross on the Dow Jones. It seems that the S&P 500 would follow in the footsteps of the Dow Jones and complete its own Golden Cross. The test above shows that might not be the case. There is more work to be done here. I am seriously intrigued why a Dow Jones GC when the S&P 500 has not yet crossed has generated a neutral S&P performance after a year. What Happens When the Dow Jones has a Golden Cross Before the S&P 500? I ran a quick study while enjoying my cup of coffee this morning. The results were not at all what I had expected, so I’m putting up a quick post. More analysis will be forthcoming. I wanted to look at what happened after the Dow Jones completed a Golden Cross before the S&P 500. 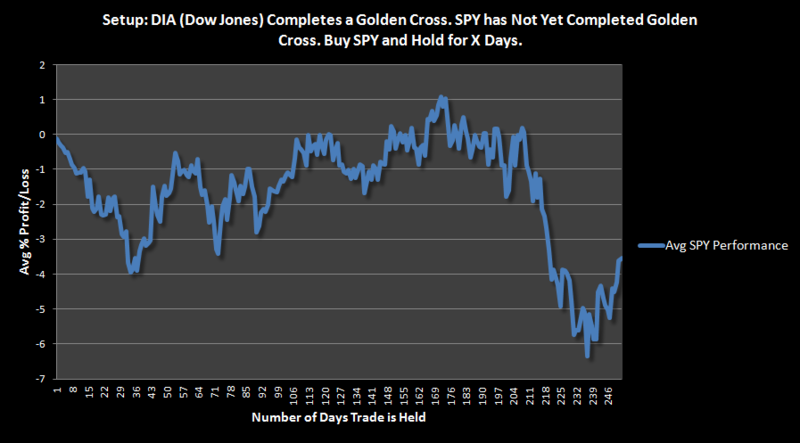 What would happen if you bought SPY to get a jump on the inevitable SPY Golden Cross. In other words, rather than waiting for the actual S&P 500 cross, you acted on the Dow Jones Golden Cross, but bought the S&P 500 (and substituted SPY for the S&P). Not very pretty, eh? I was really surprised at how bearish this turned out to be. The trade by trade results on SPY show that this setup has had one buying SPY primarily during the bear markets of the last decade. I will put some more time into this study this evening. The first thing I will do will be to use the data from the actual indicies ($DJI and $SPX) rather than the ETF data in order to look back further. The above results reflect 7 trades held for the full 252 days. A quick reading of the tea leaves before an early bedtime…SPY breakout shown above. To my eye, this is a significant breakout. Volume did not meet the average, but I’m not surprised by that since it was the first day back after a major holiday. My guess is that we see a small pullback over the next couple to few days where price will revisit the breakout area at roughly $126.50. From there I expect a bounce and higher highs. Conventional wisdom holds that should the SPY or QQQ breakout fail and the ETFs trade back into the triangle, this failure should be considered a stronger signal than the breakout itself. I am looking to buy here on any weakness. My bullishness will quickly turn to cautiousness should the breakout fail.